Posted on May 11, 2011 by Jessica Gaido | Comments Off on Showcase your work! 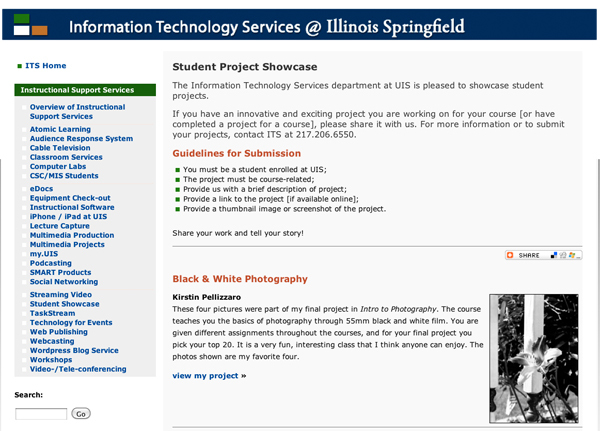 I’ve spent a lot of space on this blog encouraging faculty to get their students involved in using multimedia tools through their class projects and assignments. Not only does it get them using some of the great tools offered by UIS, but it also enriches their learning experience and makes the class and material more effective and memorable. So, instead of telling you more about how wonderful projects like these can be, I would like to show you. 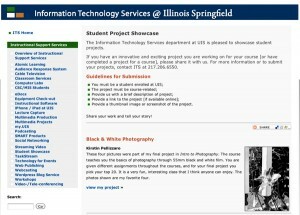 Check out our Student Showcase page to see some of the great projects students have completed for various classes. From recording videos to creating websites, these are great examples of the type of projects that your students are capable of doing. Think about all the ways projects similar to these could be incorporated into your classes next fall. And remember, we are always looking for new projects to showcase the wonderful work of our students, so be sure to let your students know! As always, feel free to contact with any questions or suggestions on incorporating projects like these into your curriculums! Comments Off on Showcase your work!